You were born to make an impact in this world and you know it. You feel it deep down in your bones. Apathy is your nemesis and your hunger to change the world keeps you up at night. But no matter how deep this hunger growls, we can only make a meaningful impact if we are rooted in Jesus. And here's the thing: God is not interested in developing your vision first. 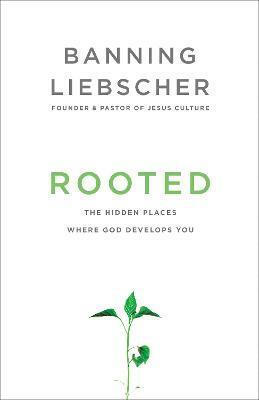 In Rooted, Banning Liebscher takes us to the life of David to show how God expands our root system in the hidden places before leading us to where we all desire to go, the visible world. It was in a field of prayerful devotion, a season of serving, and a cave of community that God prepared David for his crown, the same way God prepares us. Take a look at your own life. Are you embracing God's process, the sometimes painstaking and maddening process? When we can release ourselves to God we will find that we can thrive while He develops us, rather than succumb to discouragement. Whatever your age or season of life, it takes immense courage to slow down enough to let God grow a root system in your life so that you can bear fruit that remains. You are where you are because God has planted you there. Discover what it looks like to embrace His process so you can do what He has called you to, change the world. --Matt Redman, songwriter, UK "So it's about time we have a book from Banning Liebscher, after his years of leading the Jesus Culture movement and gatherings of hundreds of thousands of young leaders around the world! Banning hits the jackpot with this new book on identity, purpose, and calling--a much-needed and timely message and a challenge for all leaders. Rooted reminds us that leaders must not only embrace the process of becoming who God has called us to be but actually love it too!" --Brad Lomenick, past president of Catalyst and author of The Catalyst Leader and H3 Leadership "Banning takes us back to the basics in this brilliant, simple book. Rooted is a gift to an entire generation that could otherwise easily forget or, worse yet, never hear the foundations for a distinctive Christian life." --Gabe Lyons, Q founder and author of Good Faith "This foundational concept of being rooted is so timely for our culture. Strong winds will come at us and want to take us in every direction, but only the trees that have deep roots will stand when these winds blow. It's our unseen self that truly is our strength. I highly recommend anyone to dig deep into these pages. Thank you, Banning, for such an important book for our days." --Chris Tomlin, singer and songwriter "I've been doing life and ministry with Banning Liebscher for more than fifteen years. I've watched him live out the message that is his new book, Rooted. I've watched as Banning has continuously surrendered his life to God, devoted himself to prayer, served the Church, and intentionally moved toward relationships and challenges within community. He is certainly a leader who has stepped out in faith, allowing God to develop deep roots in his life. I have personally been challenged by Banning's uncompromising trust in God and commitment to being strongly rooted in Him. The message of Rooted is a timely and prophetic message this generation needs to hear. In an age where everything is so attainable and we are all encouraged to dream big, it is so important to understand the cost of what God calls us to. It's easy to dream and have vision, but to surrender our lives in trust to God and to allow Him to develop us from the inside out takes tremendous courage and strength. But it is possible and so incredibly important! If you are in it for the long haul, if you want to be able to sustain the dreams God has put in your heart, if you want to bear fruit that will last, this is the book for you!" --Kim Walker-Smith, president of Jesus Culture Music and Jesus Culture Publishing "This book connects with my soul! Amidst the highs and lows of life, my heart longs to be grounded in Christ. To be rooted in His truths. To be reminded that before God can work through us, He must do a work in us." --Kyle Korver, professional basketball player for the Atlanta Hawks "Few men in our generation have shaped the songs we sing, the places we gather, and the spiritual atmospheres we encounter, like Banning. In his book Rooted, it's easy to see his gift for practical lifestyle leadership. Banning's words have a profound undercurrent to push you into developing spiritual integrity. Many of us are looking for a front-row seat to an honest and real conversation about what it's going to take to go the distance. Rooted is a resource you want to have close throughout the years. It's a must-read book!" --Havilah Cunnington, director of Moral Revolution and founder of Truth to Table Ministries "Few voices of this generation are qualified to both biblically and practically detail the process through which God roots us into our purposes. One of those voices is undoubtedly Banning's. In his new book Rooted, Banning expertly engages the slow-motion button and give us powerful step-by-step insight into how God develops us to be who He has willed for us to be! Great read!" --Chris Hill, senior pastor of the Potter's House of Denver "Banning is a general to the modern generation. He has great insight into discipleship and raising up a generation. This book will impact and empower you to live a life of greatness. I thoroughly recommend this book to you." --Russell Evans, founder and director of Planetshakers "In every generation a heart comes along that beats so loudly for God, the sound is heard around the world. Banning Liebscher possesses this kind of heart--a heart whose soil continues to be tilled, watered, tended, and tested by fire--producing lasting fruit that nourishes the nations. In his book Rooted, Banning takes the enormous fruit of his own life and puts it directly into the hands of each reader, practically walking you into a life so rooted in intimacy and wisdom, it can thrive in every season." --Christa Black Gifford, speaker, songwriter, and author of God Loves Ugly and Heart Made Whole "Rooted, the latest book by Banning Liebscher, is both intensely practical and wonderfully profound. I've had the pleasure of watching Banning become what he has written about--a man deeply rooted, who bears much fruit. His life in God is rich and real. For this reason, God is using him to transform the lives of countless people around the world. Learning to embrace God's process in our lives brings us to a place of rest, where trust becomes a natural expression of our relationship with God. Rooted is sure to have great impact on all who read it." --Bill Johnson, Bethel Church, Redding, California, and author of When Heaven Invades Earth and Defining Moments "Finding your identity in Christ is so important in today's world. Rooted gives you the fundamental skills to guide you into being fully grounded and established in Christ, producing fruit that lasts. This book shows us that when we are fully rooted in Christ, we are positioned to influence the world around us." --Luke Ridnour, thirteen-year NBA veteran "Everyone champions accomplishments, but not many people champion the journey. I love Banning's take on how to embrace the journey and trust God on your way to enduring fruit. This book will help you redefine what success looks like in your life. It will give you keys to help you lean into the Lord when you are in process or feel far from your destination. And you will find yourself getting built up and learn how to enjoy the different seasons of life." --Kelly Clark, Olympic gold and two-time bronze medalist in snowboarding halfpipe "In order to fully achieve all that God has called us to do in our life, we must know our God-viewed identity! I believe Banning does that in Rooted by taking us through David's life and showing us how engaging in high-trust intimate relationships with God and community will allow us to truly serve others in a way that people will see Jesus and be impacted by Him." --Jeremy Affeldt, retired Major League Baseball pitcher, three-time World Series champion, and author of To Stir a Movement "Many Christians struggle with the illusion of choice, believing there are multiple paths to purpose and passion. In Rooted, Banning invites us on a journey down the narrow path that defines the process of becoming fruitful in our service to Christ. You will find this path to be both practical and biblical, one that defines terms like serving, humility, and community. A legacy is a history worth repeating; Rooted equips and encourages us to embrace our true calling, following Jesus and living a legacy that produces everlasting fruit." Banning Liebscher was on staff at Bethel Church in Redding, California for eighteen years and founded the ministry Jesus Culture during that time. Banning and his family, along with the Jesus Culture team, relocated to the capital of California where they started a church, Jesus Culture Sacramento. Their vision is to see people encounter God, be empowered in community, and engage their city for revival and transformation. He and his wife, SeaJay, have three children.